Tickets: Free. Ballot is now OPEN! Closes 15th October. Ballot Closes midnight on Sunday 15th October 2017! 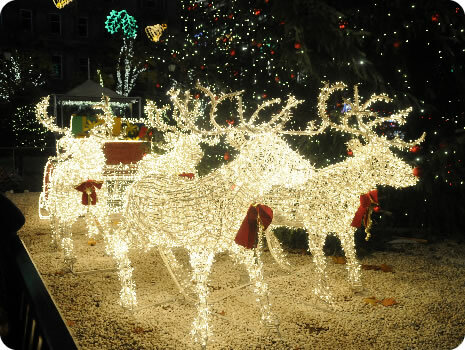 Wrap yourself and the kids up warm and head along for a special night in George Square on the 19th of November 2017, for Glasgow’s annual Christmas Lights Switch On event. This year you’ll be treated to a night of fun and frolics as George Square’s monuments and Christmas tree are lit up once again. The final line-up and hasn’t been announced yet, but you will certainly enjoy the Christmas carol sing along, then join in the big countdown and watch the spectacular fireworks display! Tickets for 2017 Christmas Lights Switch On in George Square are being balloted again due to the previous few years’ phenomenal demand. You must enter the ballot before midnight on Sunday 15th October 2017. Only one entry is permitted per household, and there is a maximum of 6 tickets per household. The ballot will take place in October, after entries close on the 15th October. Sign up for the Glasgowvant newsletter and we’ll let you know if any of the details for the George Square Christmas lights switch on change. Wow – your son has aged fast, the ballot has only been in place for the last 4 years. Please enter the ballot like everyone else. The link is above in the article, it closes at midnight tonight. We were lucky enough to get tickets this year but I was wondering what time the lights will be switched on? My youngest is 8 months so don’t want to be standing in the rain for too long! Is it to late to get tickets? How much do they cost? Hi i havent received an email about tickets yet saying if i was successful or not . I have won tickets, I’m taking my baby who will be 2 months does he need a ticket? Yes. Everyone needs a ticket. I won tickets and I confirmed with ticket master etc and yet I haven’t received them yet ? Is there a timescale ? And who is switching them on? You should contact ticketmaster. We have nothing to do with ticket issuing so I have no idea what the timescale is. Sorry. How much are the tickets, is there any left? There was a ballot for tickets. It closed a few weeks ago. Ticketmaster are the company dealing with the ballot. If there’s nothing in your spam folder or anywhere else you should contact them or the Glasgow Loves Christmas folks who are the organisers. Does my 2 year old need a ticket? Or can me and him come along with just one ticket? Yes. This is a ticketed event. The streets around George Square will be closed. After several years of applying ,unsuccessfully,for tickets we received them on Monday. We live in Ayrshire so know how lucky we are to be among the 20% The children are thrilled to bits ! I’d be delighted to learn how many tickets were released in total.